Chingo de Mayo! Dude... some creative advertising company really out did themselves on this one... :) Chingo Bling along with the whole crew... Stunta, Capone, South Coast, El Criminal, Ice and Skor & I.T. will be at H & H Ballroom on May 7th. You can pick up presale tickets at Turntable Records for 10 bones. So if you have a turntable that you haven't used in a while... and the last time you used it... it wasn't very good to you... and 2 years later it popped up again... would you give it a spin? 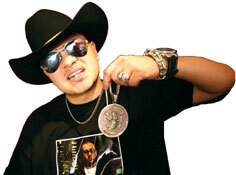 Chingo Bling is a Chicano rapper from Houston, Texas. He's been featured in an MTV documentary about Houston rap and is known for his colorful style and also for selling tamales out of the trunk of his car. Chingo Bling was also recently featured with Nelly and Paul Wall on a remix of Nelly's "Grillz" song. He was also featured in Chamillionaire's video for "Turn it up", and he was recently featured in Pepsi's Yahoo! "Mic Pass". He signed a deal with Asylum Records. Chingo Bling graduated from Trinity University with a BA in business administration, and is CEO and founder of the record label Big Chile Entertainment.